You know when you watch a show and at the end they say "visit our website for recipes and more information"? And as they say it, your listening but nothing actually goes through? 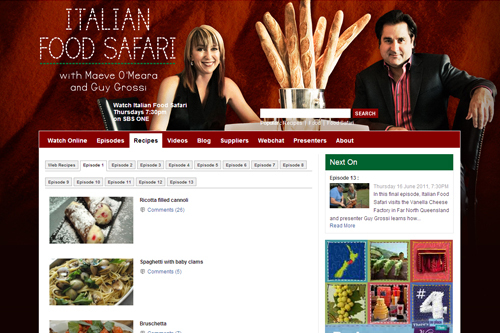 Well I've been listening to Maeve say it for years and yet never visited the Food Safari site. The other day I stumbled on the site, here. I'm kicking myself that I didn't jump on here sooner! This series has by far been the best Italian food series I've ever seen. The recipe and interviews are so traditional that I get that I get a goose bumps watching it sometimes. They cook things that I have been eating all my life. There were a few particular recipes that got me all excited. One was Spaghetti Vongole - my ultimate pasta dish. They talked about Italian Ricotta Cheesecake, which my dad used to bring home around Saturday lunch time just after closing his workshop from the morning. Even little things like an episode at an Italian bakery - once the bread comes straight out of the oven they first drizzle with olive oil before stuffing it in their faces. Bread and olive oil, with a pinch of salt, to me is heaven. The series focuses on Italian's living in Australia, most who have migrated and then pass on tradition to their Australian raised kids. Which is kind of like my Dad and me. What to do with leftovers? My name is Natashia Bevilacqua. I have an Italian father, and an Australian mother, and I‘m from Perth, Western Australia. I’ve always been obsessed with good quality food, in particular, traditional rustic Italian / peasant food. Over the years I have collected numerous recipes from magazines, newspapers, the internet and friends and family, and I have purchased my weight in cook books. Always intrigued by the idea of making these recipes, I rarely find the time to actually carry it out. Inspired by the many food blogs I visit every day, I have decided to give it a go myself!